We run tailor made Bass Fishing Trips throughout the year. Bass fishing trips! I must confess Bass fishing is probably my favourite sort of fishing. The expectation of a take, the fight, the excitement. Then, you see this marvellous silver shape just cruising just below the surface. At that point, you attempt to guide it to the net. 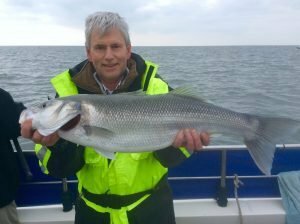 If you want the opportunity to specifically target and hopefully catch a personal best Bass, give me a call on 07754 324270 or send me an email via my Contact Us Form Then we can talk about the particulars. With this type of fishing, you will need some previous angling experience and you will require your own equipment. The method I use to fish for Bass was taught to me by a friend. He fishes commercially for them with a rod and line. With practice this is a very rewarding experience. Along the Sussex coast there are many reef areas and ship wrecks that hold Bass nearly all year round. 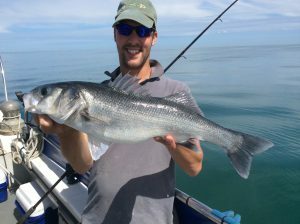 One of the best areas is probably the Kingmere Reef which is a few miles out from Littlehampton and just a 40 minute boat ride from Shoreham. Not all of the wrecks are known for holding Bass and quite often we will visit several marks to chase them down. I target the Bass with a live bait. I have found this to be the best way of catching these beautiful hard fighting fish. Using lures of one sort or another, can of course be very successful and productive, but I have found the smaller specimens are on the whole attracted to lures. The larger fish do seem wary of pirks and lures. (My opinion anyway). No Bait = No Bass. We start the day by catching the bait and placing it into a large tank which is continuously fed with fresh seawater. Experience of doing this has taught me that just catching the bait can be a lot of fun and inspire a degree of competition and banter amongst the crew. It’s not often the competition is for the smallest fish and you have to return anything too big! Once we have enough bait swimming about happily in the tank, we tool up for fishing properly. On the Bass fishing trips, the maximum number of anglers aboard is limited to 6. This gives everyone enough room with their live bait swimming about down below and not get tangled up. As stated above. You will require your own fishing gear and have previous angling experience to join us on a Bass fishing trip. As of July 2015 the minimum landing size has been increased to 42cm.